Wondering how to cook bratwurst? 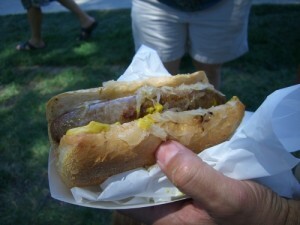 For the best, most delicious bratwurst recipes, you should be prepared to go outside of your comfort zone a little bit. You may be tempted to just throw them in the oven or stick them in some boiling water, but allow yourself to be surprised. It is amazing what a little fruit juice can do. To create a mouthwatering apple bratwurst meal, you first need to simmer your bratwurst in apple juice or cider for approximately 15 minutes. Brats will be tender and delicious with a hint of apple flavor. Don’t forget Bratwurst’s partner-in-crime, sauerkraut! Put the two together on a home-baked hot dog bun and you’re in for a treat! To round out this delicious meal, combine your apple brats with baked beans, dinner rolls and your favorite beverage. I have found the best pairings to be with a carbonated drink such as apple cider, ginger ale or a soft drink. The carbonation bubbles tend to mix well with the bratwurst. Mmm… Delicious.